What Makes Jade Ocean Different from the Other Luxury Condominiums? Why Should You Go for Jade Ocean to Enjoy an Opulent Beachfront Lifestyle? The beachside holiday locations are the most popular travel destinations in the world. Millions of tourists every year visit these places to enjoy their vacations with their friends and families. Most of the time, it is seen that people enjoy the beachfront lifestyle and the fun-filled outdoor activities that the beaches offer to them. The serene and peaceful ambiance of the beaches gives people an eternal feeling of contentment and happiness. It acts like a balm and has a soothing and calming effect on the tired body and soul. Furthermore, the natural beauty of the beachside locations is something to cherish and for all these reasons, people love to spend their quality time on the beaches, close to the mighty water bodies. There are countless beautiful beaches in the world, and the Sunny Isles Beach is one of the most famous beachside locations that are widely popular all over the world. This beach city is not only famous for its natural beauty but also for the wide range of luxury real estate properties that this beach offers to the property buyers. There are a plenty of luxury properties that have been constructed on this beach and have adorned this beautiful beach more beautifully. 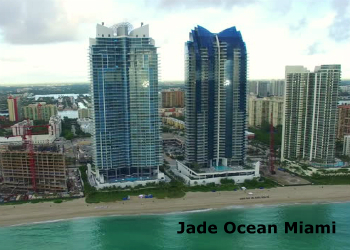 Jade Ocean is a magnificent luxury condominium that is located on the Sunny Isles Beach and is considered as one of the most popular condominiums in this area. This condominium is a perfect choice for those buyers, who are looking for an ultimate luxurious abode in a heavenly beautiful location. This luxury condominium is situated in a perfect location, wherefrom the residents can enjoy the closeness to the ocean, as well as can reach the important areas like Fort Lauderdale and downtown Miami in just a few minutes. Also, hospitals, schools, business centers, night clubs, shopping centers, etc. are not far away from this place. Jade Ocean Miami offers a number of luxury amenities and facilities to the residents, making their stay in this condominium as comfortable and lavish as possible. This 51-story high condominium offers 256 grand units, which are splendid in their interior designs and furnishings. The units are spacious and come with all the modern residential features and amenities that every condo buyer becomes impressed to avail. The world-famous architect and designer, Carlos Ott, has given the magnificent and splendid appearance to the building, making it the favorite of every condo buyer. The building offers extraordinary and opulent features and the units are available in different sizes, making it possible for the condo buyers, having different requirements and budgets, to afford the units. Many renowned real estate companies are dealing with the sale of units of this luxury condominium and a very notable among them is One Sotheby’s International Realty. If you want to know anything about this luxury condominium and want to buy a unit, you may visit their website or you can contact the sales agents of this real estate company at (305)332-3574.